Brookfield Property Partners (TSX:BPY.UN)(NASDAQ:BPY) offers a juicy yield of just over 6.6% after it increased its dividend by nearly 5%. The market must also be pleased with its Q4 or 2018 results, as the stock popped 5.6% on Thursday. There’s a strong reason to believe that the stock is still a great value and that its yield is sustainable. Brookfield Property has been buying back its shares at a steep discount from its book value. Last year, it bought back more than 4.6 million units at an average price of US$17.35 per unit, which is a discount of about 40% from its recently reported book value. 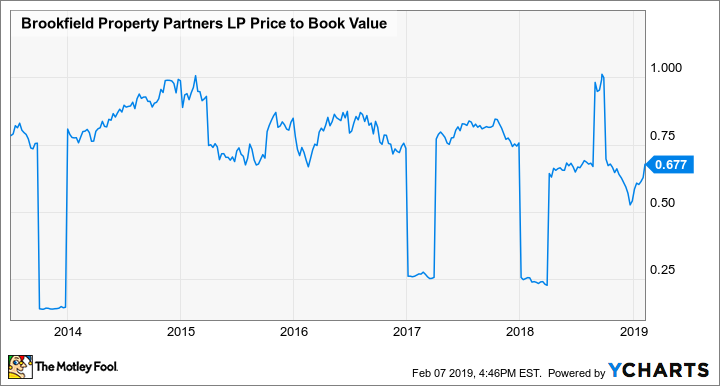 BPY Price to Book Value data by YCharts. A chart showing the long-term price-to-book-value of NASDAQ:BPY. To put things in perspective, though, Brookfield Property will almost always trade at some sort of discount from its changing book value, because real estate properties are illiquid, and it’d be hard to convert properties to cash. Thankfully, selling properties for gains isn’t Brookfield Property’s primary goal. Brookfield Property is more focused on building a diversified portfolio of quality real estate assets to generate sustainable and growing cash flows. Therefore, it makes sense to focus on the company’s cash flow generation. In 2018, it generated nearly US$1.18 billion of funds from operations (FFO), which was nearly 16% higher year over year. On a per-unit basis, its FFO increased by almost 2.8% to US$1.48. This alone was more than enough to cover for its 2018 cash distribution with about 25% FFO left over for reinvestment. Additionally, management expertly maintains a buffer to improve the payout ratio with a continuous capital recycling program. Last year, it realized gains of US$490 million from selling mature or stabilized assets, which added a buffer of about US$0.61 per unit, resulting in an actual payout ratio of under 61%. Brookfield Property’s core office and retail portfolios are doing fine. For example, the occupancy in its core office portfolio increased 60 basis points to 93.5% in Q4, while leases signed had average rents that were 8% higher than leases that expired. Despite Brookfield Property is trading at US$19.77 per unit, nearly 14% higher than the average price of its repurchased shares in 2018, the stock remains a great value. One big hint is that the board has approved to buy back up to US$500 million of stock between US$19 and US$21 per unit. Income investors can still buy the stable real estate stock at a meaningful discount today.